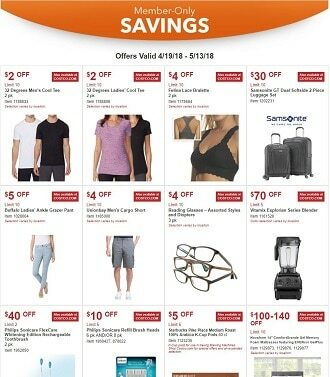 View Costco Ad Sale and Savings, valid April 14 – May 5, 2019. Don’t miss the Costco Sales for this month and grocery sales & furniture promotions. The largest warehouse club retailer in the world offers a huge range of products including Vizio 4K Ultra HD Smart Home Theater, Samsung 4K Ultra HD LED TV, Samsung Streaming Blu-ray Player, LG 65″ Class 4K Ultra HD Smart LED TV, HP Envy Touchscreen Laptop with Intel Core i7, Henckels Couteau 14-piece Cutlery Set, 32 Degrees Ladies’ Sherpa Lined Fleece Jacket, Diamond 14kt White Gold Inside Outside Hoop Earrings, and more. Shop with Holiday Savings Booklet, available only for Costco members at Costco online and in store.